Ceramic and porcelain tile floors are among the most popular choices for flooring, showers, and backsplashes. Not only because of their attractiveness, but also because they are durable, waterproof, and easy to install. However, to keep tile floors, showers, and other hard surfaces looking great for years to come, you should properly clean them via heat cleaning, by a professional, every one to three years. Although your freshly-mopped tile floors may appear thoroughly clean, they are not deep cleaned. Unfortunately, mopping only spreads dirt and grime around. No dirt is extracted when mopping. Some of the dirt is absorbed by the mop, but the rest settles into the grout. Eventually, the tile and grout appear dull, dark, and dirty. As most people already know, grout is porous. Its rough surface absorbs moisture and discolors liquids, soap scum, dirt, and oils from your body thus breeding bacteria, mold, and mildew. This ultimately leads to the stain and discoloration of the grout. 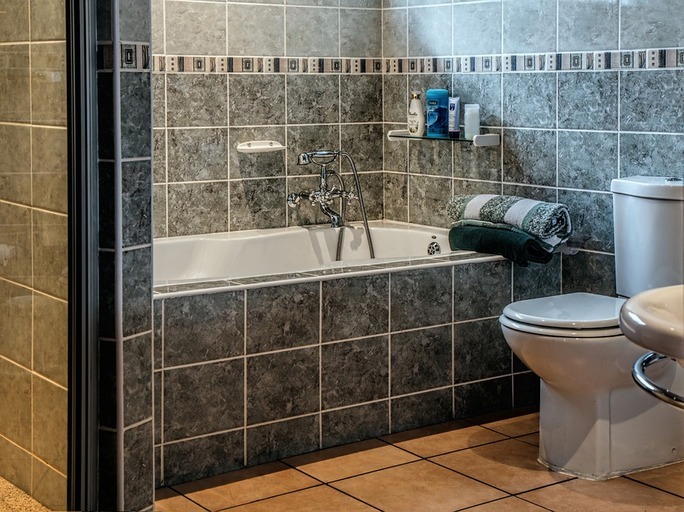 Without proper grout sealing, the moist, warm environments of kitchens and bathrooms are perfect surfaces for mold, mildew and bacteria to breed on. Additionally, if there are cracks in the grout or if the sealer is worn, moisture can sink into the grout. It is very hard to remove stains from grout after they have settled. Restoring the grout to its original color, even with proper cleaning methods, proves to be extremely difficult – if it is even possible. Regular cleaning and maintenance by a professional is a must, in order to keep your tile and grout as clean as it was the day you installed it. Using state-of-the-art equipment combined with a high pressure heat cleaning system with proven cleaning solutions, Rainbow International Restoration restores the appearance of your tile and grout to a like-new appearance. To aid in making the grout more resistant to spills as well as prolong the sleek, clean appearance of the flooring, Rainbow’s experienced, certified technicians use a truck-mounted water extraction unit with high pound-force per square inch (PSI) that also heats the cleaning solvents to ensure a deep, sparkling clean. If mold and mildew spores grow in the grout and spread, the possibility of illness and mold damage is high. Mold damage can cause respiratory distress, allergies, and intensified asthma symptoms in individuals already diagnosed with asthma. In addition, once mold has damaged your home, you will be facing remediation and restoration costs. This can be avoided by having your floors and grout professionally cleaned as recommended. The tile and grout cleaning experts at Rainbow International Restoration recommend all tile surfaces be cleaned every 1-3 years with a post-cleaning sealant applied to the grout. To keep your home or business flooring clean and free of mold, mildew, and dirt, call the Rainbow Restoration professionals at 877-853-2445 to set up a free, on-site, heat cleaning consultation.